Biddenden Vineyards held it’s 5th annual “Taste the Best of Produced in Kent” in June this year – a local food & drink day which raises much needed funds for the Kent Air Ambulance. The final totals are now in with £2781.57 being raised from this event. 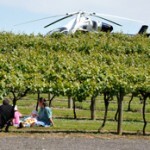 All stand holder fees were donated to the Air Ambulance, along with donations from over 1500 visitors to the vineyard on the day. A raffle was run with the prize made up from products from each of the stand holders – all proceeds were also donated with the lucky winners being Stuart & Frances Cross of Ruckinge. We would like to thank everyone for their support with this year’s event and look forward to seeing you again next year – Sunday 9th June 2013.